Working the entire core can be tough during a workout, but the V-up and then a V-up twist move is a great way to engage your entire core. This move uses a stability ball and is a great way to engage your entire core during a workout. Astrid Swan, celebrity personal trainer, says that this two core-centric move workout is effective in engaging your entire core and improving your ability to tackle your day-day life. The move requires balance, flexibility in your upper and lower back and strength from your inner thighs and multifidus (a thin muscle that runs along the spine). The move is challenging but can be modified based on your own level of strength in your abs, legs and arms. If you’re doing the movement correctly you’ll really feel it all throughout your core! If you’re interested in learning more about this core workout and how to make these moves work in your own workout routine, make sure you check out this article from Self! Click here. If you’re looking for a confidence coach in Chicago and beyond, you’ve come to the right place! As a Certified Personal Trainer for Women, Yoga Instructor in Chicago, and Pilates Instructor in Chicago, I work with successful women across the country as a Private Weight Loss Coach for Women. Here are a few more things that I do as a weight loss consultant in Chicago: Health & Fitness Training in Chicago and Health & Fitness Coaching in Chicago. In addition, I’m a fitness consultant in Chicago. I also do Nutrition Training in Chicago. If you’re looking for a Health Trainer in Chicago, you’ve come to the right place! In addition, I am a Nutrition Coach in Chicago, and a Women’s Weight Loss Coach in Chicago and beyond! Even though I am based in Chicago, I work with women across the country! For more inspiration, join our FREE 21 Day Challenge at stepitupchallenge.com. Working the core and upper body can be difficult for many of my private weight loss clients, which is why I suggest that they use TRX bands. This 5 move circuit from Jeanette Jenkins of The Hollywood Trainer is a great way to incorporate the TRX bands and utilize your own body weight to work for you while you’re working out! Simon Lawson, a certified personal trainer and TRX instructor at Fhitting Room, says that a TRX band is very effective in strengthening your core because of the level of stability it requires your body to have. They take away the element of stability by using straps to stand on, which forces your core to keep your body sturdy. This circuit from Jenkins utilizes 5 moves to give your body a well-rounded workout. The moves Jenkins is doing are relatively challenging, but they can be modified for any experience level. There are also multiple ways to do this circuit! One way to try this circuit is by doing 10 reps of each exercise then repeating the sequence. Lawson suggests doing each move for 45 seconds and having a resting period of 30 seconds between each move. He also suggests repeating this sequence 3 times. If you’re interested in learning more about this 5 step circuit and exactly how to make these moves work in your own workout routine, make sure you check out this article from Self! Click here. While working a nine to five, it feels hard to make time for a normal workout. Health and Fitness Expert and Women’s Weight Loss Coach Stephanie Mansour appeared on WCIU TV Chicago on The Jam with some quick exercises you can do around the office. From waiting for the printer to just sitting at your desk here are some quick exercises you cando with objects found around the office! Use Your Wasted Time Waiting for the Printer! When you’re printing something, it can feel like time is wasted while waiting. Insteadyou can sit down and place a package of printer paper on the top of your ankles. Thenpull your abs in keep your legs straight and lift the legs up. This exercise works the innerthighs and the quads as well as burning calories and building strength. A Case of Water or Weights? If you have some spare time, and a case of water lying around the office, this is a greaterexercise to do! Hold the case of water, pull the abs in and then lower down into thesquat. If you feel good after doing the squat a couple of times, you can step it up byadding an overhead press with the water. Using Everyday Desk Objects is a Great Option! Spring and Summer are around the corner and with that comes short sleeves! To toneyour arms, you can use staplers as one pound weights for bicep curls. While doing thisexercise you should hug the elbows in by your sides and then curl up towards yourshoulders. To make it a bit more challenging you can hold two staplers in one handmaking it more of a two to three pound weight. Don’t Be Idle at Your Desk! While working, a lot of that time can be spent at your desk. A great option is to try thisexercise that works your core while sitting at your desk. First touch the desk lightly, liftyour feet a couple of inches off the ground and squeeze your inner thighs. Then withyour abs tight, scooch back a little bit and then pull yourself forward. Make sure thatyou aren’t using your arms, that’s cheating! Although walking somewhere close to your office and getting something quick is tempting, it’sbetter to pack your lunch. An easy way to jazz up your everyday lunch is to add healthy pasta.My personal favorite is Dreamfields pasta, it has seven grams of protein and five grams of fiber. For more nutritional advice I offer a 7-Day Easy Meal Plan + Recipe Book. Good luck and stay active around the office! As a private weight loss coach and a private fitness coach for women, I specialize in helpingsuccessful women lose weight. If you’re looking for a life coach, a wellness coach, or a confidence coach in Chicago and beyond, you’ve come to the right place! As a certified personal trainer for women, YogaInstructor in Chicago, Pilates Instructor in Chicagoland, and certified professional life coach inChicago, I work with successful women across the country as a private weight loss coach forwomen. As a fitness trainer in Chicago, many of my clients ask for workouts that are impactful but won’t take up too much of their time. When they request shorter workouts, I always have them try HIIT workouts such as this total-body workout from Jeanette Jenkins! HIIT workouts are fantastic for women on the go because they require all of your energy for a shorter period of time, which quickly leads to a higher heart rate. Another reason these workouts are so popular for my personal weight loss clients is that many of them don’t require equipment, they can be done anywhere! This circuit that Jeanette and her 14 year old niece are doing includes moves that will help strengthen the upper body, core, and lower body, while also using plyometric movements. The plyometric movements are fantastic for the everyday woman because of the way they improve your reaction time and speed! A plyometric move is any movement done with a burst of energy, like a jump! While the moves in this workout aren’t for beginners, if you’re interested in the modified version of this circuit (and how to work your way up to this circuit), check out this article I helped contribute to from SELF. Click here! Health and Fitness Expert Stephanie Mansour shares her holistic approach to losing weight and getting healthy on TV stations across the country! You can find her on the Today Show, The Doctors, Dr. Oz, NBC, CNN, HLN, and many more TV stations! One question my personal weight loss clients are always asking me is what I do to stay in shape and maintain my healthy lifestyle. They’re always shocked to learn how many workouts I do in the comfort of my own home, or wherever I’m traveling! Staying motivated fitness wise is easy when you’re enjoying what you’re doing. I always encourage my clients to do exercises that they have fun doing! About a year ago I started learning how to play tennis and found out that I loved it. I enjoy myself so much when I’m playing tennis that I forget about how great of a workout I’m getting. Another trick I do to stay in shape is to do things that make myself feel good. Every week I make sure to squeeze in Pilates classes, tennis, and massages along with my traditional workouts. These are the parts of my workout routine that really help to clear my mind and do good for my body! Pilates classes are some of my favorites to take because of how great they are for my back. If you’re interested in seeing the workout routines of other fitness professionals such as Brian Zehetner, Ronnie Lubischer, Ali Cook Jackson, Jorge Cruise, Omari Bernard, and Craig Ramsay that I shared with with NBC News Better, Click here! Foam rollers are the hot ticket item right now. They can help you break up the knots that form in your tissue, which leaves you with a higher range of motion and a lower level of muscle soreness. As a health and fitness trainer in Chicago, I get asked all the time about how to properly use these life changing tools! Foam rolling isn’t just for your back! I tell my private weight loss clients to also use a foam roller on their glutes, quads, and on the backs of their shoulders. This just further helps to get rid of those tight muscles! I also let my clients know that it’s very beneficial to their bodies after a workout, but it’s fantastic for your muscles every day. It doesn’t have to be for a long period of time – even just 10-15 minutes will do the trick! One of the biggest secrets to foam rolling is that consistency is key. The more often you do this in your daily routine, the better your results are going to be. Studies have found that even as little as three days of foam rolling can make a difference on your muscle fatigue! Are you interested in learning some of the best moves to use with a foam roller? 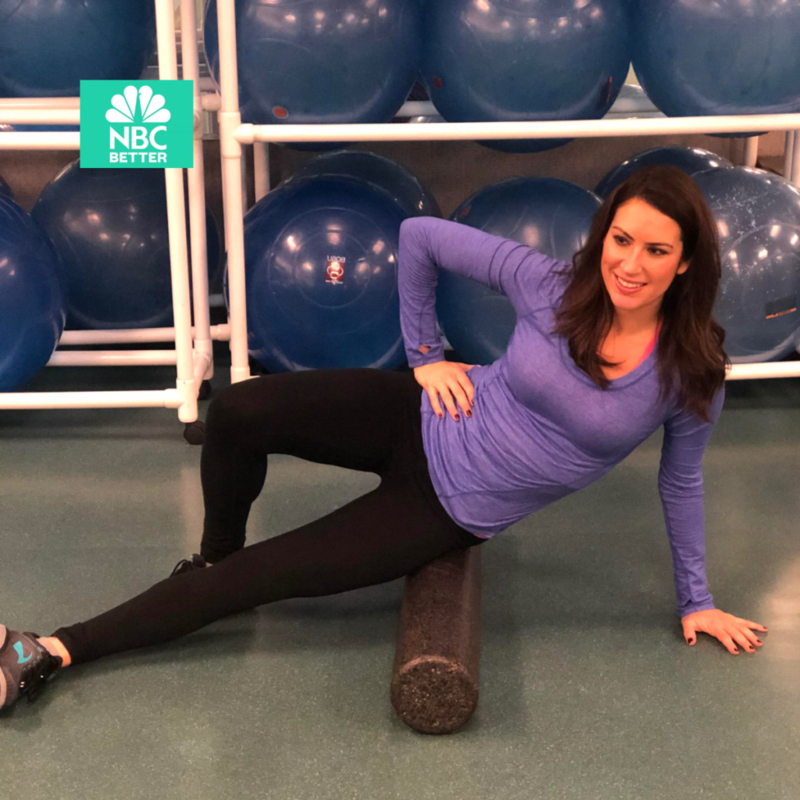 Then you’ll love this article I wrote for NBC News Better that includes moves, recommended practices, and which foam rollers I recommend. Click here! Are you one of over 26 million Americans who have to deal with the frustration of allergies every year? If so, you’re in luck! Recent studies have shown that exercise has been proven to lessen those pesky allergy symptoms. As a fitness consultant in Chicago, I love helping my clients lessen the burden of their allergies. We all know that it’s important to exercise, but it’s recently been proven that exercise helps to give your immune system a boost over time. While exercise may not cure your allergies all together, it will help to improve them gradually. The type of exercise you do matters if you’re exercising in order to help alleviate allergies. I always tell my private weight loss clients to try doing yoga, pilates, or even walk when they are having allergy issues. These are more gentle exercises that won’t be counterproductive. Are you interested in learning about the about using exercises to alleviate your allergies that I shared with Natural Awakenings? Click here! As a personal fitness trainer in Chicago, I often get asked about short workouts that can yield fast results. To these questions I always inform my clients about HIIT workouts! These workouts include short bursts of exercises with periods of less intense active recovery. I designed this 15-minute full body workout for my clients who needed to lose fat and gain strength quickly, and the best part is it only takes 45 minutes a week! The first circuit in this free workout is the straightforward HIIT. I designed this circuit based on moving the body forward and backward and up and down. You’ll find common exercises that don’t require any equipment such as squats, push ups, and planks. The second circuit is the sideways HIIT. This circuit was designed to work you laterally. These movements go from side to side and include side lunges, bicycle abs, and tricep dips. The exercises in this circuit also don’t require any equipment and are perfect for a workout on the go! Are you interested in trying this equipment-free, full body, 15 minute workout I designed with NBC News Better? Click here! As a fitness trainer in Chicago, I see my personal weight loss clients face the mental battle of going to the gym. One of the biggest reasons they tell me as to why they didn’t go to the gym is due to the fact that they didn’t feel like preparing everything they would need. This is why I always encourage my clients to make sure they have their bag packed for the gym beforehand! If you have everything already ready, you’re much more likely to go. Are you interested in knowing what exactly these fitness professionals have in their workout bags? Click here!